Well, that was a pleasant surprise. I didn’t expect to like this book at all—I wasn’t even going to give it the time of day, but seeing some preview pages caught my eye and I decided to give it a chance. I’m glad I did, because this was easily one of the most enjoyable reads I’ve had lately. 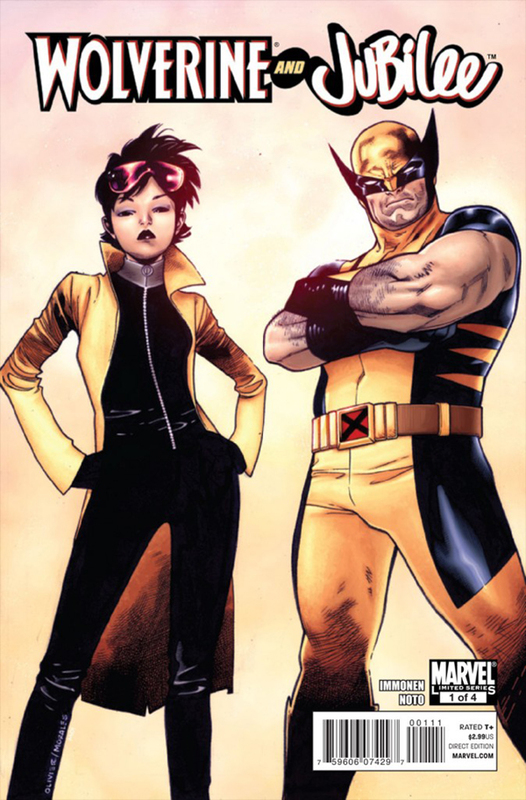 You see a title like “Wolverine & Jubilee” and you think it could go either way. The “Wolverine” part could be good—but then, how much of that actually has merit and how much of it is just a plug by Marvel to pull you in? The “Jubilee,” on the other hand, kind of induces a bubbly gag reflex, and you think to yourself, dear God, why would I want to pick up this book? But you do want to pick it up—and here’s why. If you’ve followed the events of Victor Gischler’s X-Men series at all—on which I admit I am way behind—you know by now that our dear Jubilee is—SHOCK—A VAMPIRE(bolditalicunderline)!!! Who the heck writes about vampires these days, anyway? Where did those guys come from? Does anyone even like vampires anymore? Hate for the vampire fad aside, Jubilee is now one of the undead, and she’s had some of Wolverine’s blood transfused into her in the hope that his healing factor kicks in and takes the edge off of Jube’s crazy bloodlust. And it’s working. Kind of. There’s a very humorous opening scene in which Dr. Rao and Emma Frost debate exactly what “it’s working” actually means. This four-issue miniseries, then, takes a bigger focus on what’s happening to Jubilee post-vampire encounter, and how the X-Men and Wolverine are handling the situation. My immediate reaction this idea was “Why should I care? It’s Jubilee.” But then I kind of mulled it over, thought about how I haven’t really read Jubilee in quite a while, about how great her scene with Wolverine in Girl Comics was, and got nostalgic to my days as a kid watching the 90s animated series. Then I looked at the cover of this and saw the names Immonen (that’s Kathryn, not Stuart) and Noto, and I was basically sold. The first issue centers on Wolverine’s concern for Jubilee, who he sees as being his responsibility, as his blood now flows through her veins. The X-Men are wary of letting Jubilee out amongst the other students, believing her desire for blood is too strong for her to control, and that she will ultimately seek others on whom to feed. Jubilee’s reaction is as you’d expect—rage, angst, confusion, frustration. When she leaves the mansion (at night of course) and encounters a stranger, Wolverine tracks her down and finds her alive, but amongst a heap of bloodied bodies. In between scenes of Jubilee lashing out and Wolverine attempting to control the situation, there are some interesting moments with other characters, including Santo—who’s crushing on our vampiric Jubes; Armor—who doesn’t trust her and picks a fight; and Emma Frost—whom Kathryn Immonen writes spectacularly well. Heck, even the inclusion of Pixie can’t ruin this book for me. Immonen makes it that good, and Phil Noto’s art is something I’ve come to realize I’ve missed. I fell in love with his stuff back during his run on Birds of Prey, and I dare say he’s even better here. Jubilee’s current situation is going to breed a great storyline here, and it’s about time they did something pertinent with her character. Her relationship with Wolverine is almost taking on an X-23-like feel, and I actually hear she’s going to be appearing in Laura’s book shortly. Under either title, she’s going to be in good hands, and the fact that they’ve made me actually care at all says a lot. Can’t wait for issue #2. This entry was posted on 02/04/2011 by ravenhaired. It was filed under Comic books, Female Characters / Creators, Reviews and was tagged with Jubilee, Kathryn Immonen, Marvel, Phil Noto, Wolverine, X-Men. I totally agree with your review. I have a love-hate relationship with Wolverine (as dies his creator), and I’ve always liked Jubes. I picked it up solely from hearing about it on Alan’s blog and LOVED, LOVED, LOVED it. I’ve been x-men deprived for years so I don’t know who half of these characters are. I like Rao and Santo though. Any reaction to the Age of X crossover? I feel more connected to it than to the other X titles since everyone is new in this reality.